Why don't plants have any chlamydial symbionts? It seems that all known chlamydiae are obligate intracellular symbionts -- they can only reproduce inside eukaryotic cells, and remain metabolically inactive outside of their hosts (a virus-like lifestyle). Chlamydiae can infect different kinds of animals (mammals, birds, fishes, arthropods, crustaceans) and unicellular eukaryotes (such as environmental amoebae). Remarkably, chlamydiae have never been found in plants or in other plastid-containing organisms (red and green algae, plants and glaucophytes, together known as Plantae or Archaeplastida). On the other hand, as I have explained in a previous post (A cell potpourri: eukaryotes and their organelles), an important number of Archaeplastida genes are derived from ancient chlamydiae, suggesting a long-term symbiosis between ancestors of chlamydiae and Archaeplastida. 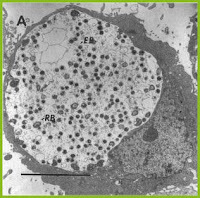 The bacterial endosymbiont was later lost, leaving some of its genes behind. So, the question is: why don't present-day Archaeplastida have any chlamydial symbionts (parasitic, mutualistic, commensal)? Why can't they be infected, once more, by chlamydiae? You can contribute to this discussion here (post a comment), or at the PLoS ONE site where a relevant article was published (Chlamydiae has contributed at least 55 genes to Plantae with predominantly plastid functions). Chlamydiae.com (a comprehensive reference and education site). Electron micrograph of a cell infected by Chlamydia trachomatis. © American Society for Microbiology. Reference: Beatty WL, Morrison RP, Byrne GI. Persistent chlamydiae: from cell culture to a paradigm for chlamydial pathogenesis. Microbiol. Rev. (1994) 58, 686-699.